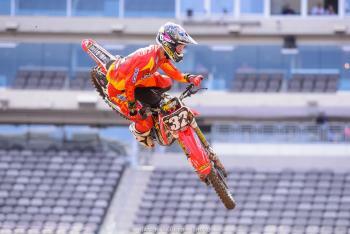 For the first time since 1991, Monster Energy Supercross has returned to the Northeast. Droves of people turned out for the Party in the Pits—we heard the number 30,000 get thrown around—with more expected tonight. Following a night filled with rain, and even some today, the track was very slick, which may cause problems tonight. There is a 30 percent chance of rain tonight, according to weather.com. The big news this week was the injury to current points leader Martin Davalos, who will miss the remainder of Monster Energy Supercross with a broken ankle. Davalos’ teammate Blake Baggett will also miss the last two rounds after taking a rock to the eye, resulting in a deep laceration on his eyebrow. With Davalos out, GEICO Honda’s Justin Bogle, currently eight points back, is in prime position to capture his first career 250SX title. Yamalube Star Racing Yamaha’s Jeremy Martin was fastest in 250SX practice with a 55.066, which was nearly a full second faster than second place Vince Friese (56.029). Friese wasn’t the only privateer to have success, as Jimmy Decotis (eighth), Jackson Richardson (ninth) and Landen Powell (tenth) were all inside top ten. With all three Monster Energy/Pro Circuit Kawasaki riders out, Bogle is the only 250SX rider with a main event win. Injuries have thinned the field, which could lead to a first time winner tonight. In 450SX, rain in the second practice made for slower times, which left Ken Roczen’s 55.158 in the first practice as the fastest time. 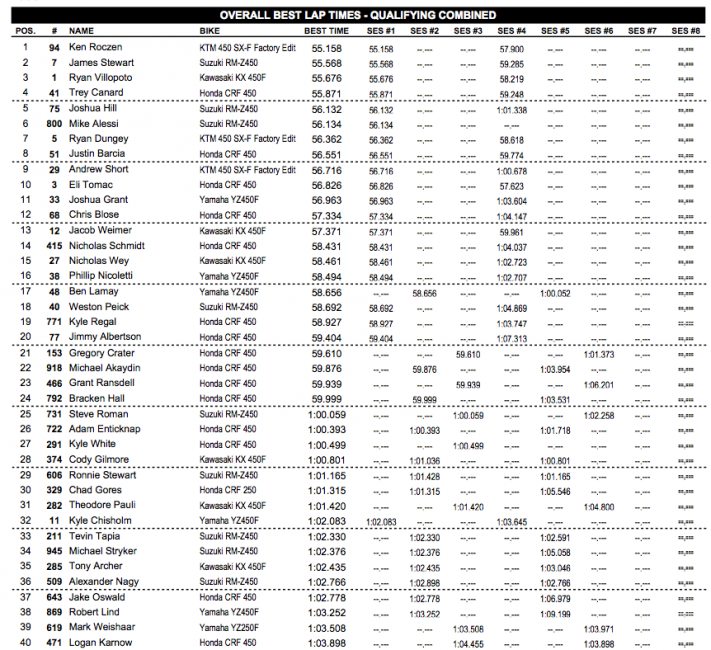 James Stewart, Ryan Villopoto, Trey Canard and Josh Hill would round out the top five. Villopoto can become just the second rider in history, joining Jeremy McGrath, to capture fourth consecutive 450SX titles as he is currently 48 points clear of James Stewart with two rounds to go.